You probably know it’s important to drink water throughout the day, but sometimes it’s hard to choose it over the other sugary, delicious beverages out there. The solution? 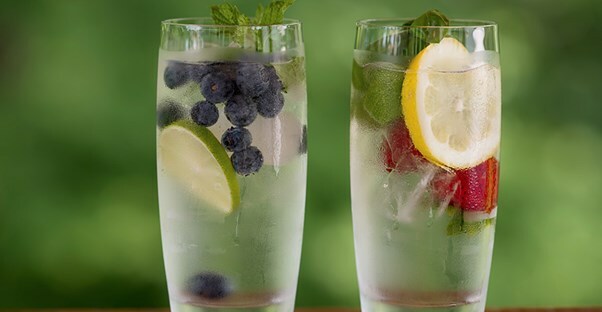 Transform your plain water with tasty and healthy fruit infusions! By adding various fruit combinations to your water, you can up your daily intake while also consuming good-for-you vitamins and minerals. Fair warning though—you’ll have a hard time choosing between these ten tried and true fruit (and herb) combos. Healthy strawberry lemonade, anyone? Simply slice up four medium-sized, fresh strawberries and one medium lemon. Add them to your water bottle, and let the concoction steep in the refrigerator overnight. For extra flavor, you can mash up the fruit so that more juice mingles with the water. Enjoy the next day with ice! This combo may be simple, but it’s so satisfying. One medium lime, sliced, with four mint leaves, crushed, is all you need for a quick and thirst-quenching beverage. If you don’t want the mint flavor to be overbearing, you can add fewer leaves or avoid crushing them. Let the mixture steep in a water bottle overnight for the best flavor. Grapefruit is so delicious it can stand alone in your water bottle. Simply slice a medium grapefruit, add to water, and let it sit overnight. Muddle half of the slices to initially release the flavor, but leave the other half alone so the flavor will linger throughout the next day. Although unconventional, strawberry and rosemary are one of those pairings that just work flawlessly. Since rosemary can come on a little strong, only use about half a sprig—you can always add more later, if necessary. Slice five medium strawberries, and lightly muddle the two in a large water bottle or pitcher before filling with water. Drink over ice. Raspberry and pineapple can take an ordinary day and turn it into a tropical getaway—closing your eyes and playing Jimmy Buffett songs helps too. Combine half a cup of fresh raspberries, slightly muddled, with half a cup of sliced pineapple (juice included). Add water, stir, and enjoy in a fun glass with ice. This combo is even better than the lemon-lime sports drinks you grew up on! Slice one medium orange, one large lemon, and one medium lime. Mash the slices together gently, and add water. Keep in the refrigerator overnight, and you’ll have the ultimate thirst-quenching beverage when you wake up. It’s perfect to sip on right after a great workout! This fruit infusion is dark and sultry, which makes it perfect for those days when you just need something a little different. Slice half a cup of fresh cherries and gently muddle them with half a cup of blackberries. Be careful not to mash the blackberries entirely, though—otherwise, you’ll be picking seeds out of your teeth the rest of the day! Slice one medium lime, and add all three ingredients to a large water bottle or pitcher, which should rest overnight. Make sure to stir before pouring into a glass and enjoying. If you need a super refreshing beverage this summer, make this infusion your go-to choice. Half of a medium cucumber, one medium lime, and mint leaves are the perfect combination for those days when you just can’t seem quench your thirst. Slice the cucumber and lime, mash them lightly (just to release some of the flavor), and add mint leaves to taste. Remember, mint is a very strong herb, so less is often more. For some water with a little kick, mix half a cup of fresh raspberries and one medium, sliced lime. This is the perfect infusion for the days you’re not craving anything super sweet. Don’t forget to refill your water bottle with fresh water and ice periodically so that you can enjoy this refreshing beverage all day long. With flavor like this, you’ll feel like you’re relaxing at a spa. Slice one medium cucumber, one medium lemon, and one medium lime. Add the three to water, in addition to half a cup of fresh basil. Slightly muddle the combo to get the maximum flavor, and then let it chill in the refrigerator while you sleep.